Ferrari president Luca di Montezemolo has said teams will present a united front in their showdown talks with FIA president Max Mosley later today to discuss the future of Formula 1. Following several hours of discussions between team principals on Friday afternoon on board Flavio Briatore's yacht Blue Force to discuss their plan of action, di Montezemolo was positive that the teams had reached some 'constructive' conclusions. 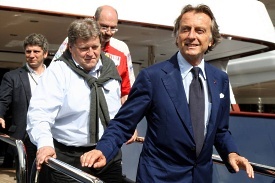 "As always there's been a very good meeting, with a very good atmosphere and we are all together," said di Montezemolo. "FOTA is now an organisation with a common view. We will not enter in the championship with these rules and this governance. So we have to discuss about the possibility to change the situation in a constructive way, but in a very clear way. "Because we want Formula 1, we don't want something different." When asked if he was positive that an agreement could be reached to prevent a walkout by leading teams, di Montezemolo said: "We will see. It is important that our view of the future is absolutely shared." Di Montezemolo's comments come after Mosley warned on Friday that F1 did not need Ferrari. "Formula 1 would not be the same without Ferrari but no team is indispensable," he told Gazzetta dello Sport. "Most of the teams understand that we cannot continue to spend at current levels. The real question is: do we control costs by restricting the work of the best engineers or do we control costs by restricting the amount of money available. To me, the answer is clear - hence the cost cap." sustainability of F1 as well as making conditions right for new teams to enter." Mosley said he hoped that he would be greeted by 'constructive' talks from the teams in Monaco, following threats to walkout last week's talks at Heathrow. "It's a pity that two teams did not want to discuss compromise last Friday in London," he said. "They kept trying to get the other teams to walk out. I hope that with Luca present things will be more constructive this time."